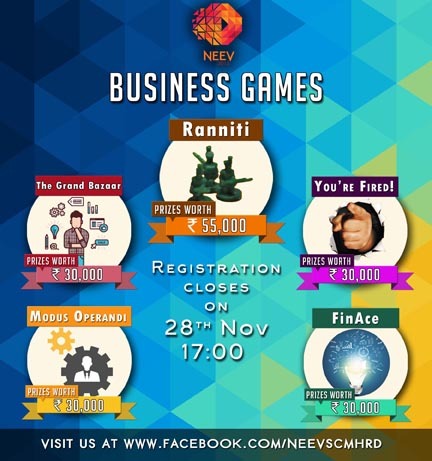 Business Games The soul of NEEV, with events across all verticals of management – HR, Marketing, Finance and Operations. Participants find themselves presented with real life situations to test their managerial capabilities. Business Conclave NEEV takes pride in the involvement of entrepreneurs and industrialists like Mr.Kumar Mangalam Birla, Mr. Aditya Ghosh (CEO of Indigo Airlines), Mr. Harsha Bhogle (Indian cricket commentator & journalist), Mr. ASK Reddy, and Gaurav Modwel (CEO Wadhawan Holdings & FC Pune City). Celebrity Nights With previous association with Indian artists and celebrities like KK, Agnee, Indian Ocean, Parikrama, Raghu of Roadies, Hard Kaur, Sivamani, Raghu Dixit, Lost Stories, DJ NYK, Kanika Kapoor and Motherjane, NEEV has also gone international with bands like Akcent and DJ Jaytech. Not to mention, NEEV was the first ever organization to bring SUNBURN Goa to Pune in 2013. Augustus NEEV’s flagship business event, the hunt for India’s best student manger. Spread across 12 gruelling rounds, traditionally drawing the elite potential managers of the country with an attractive reward of INR 2,00,000 for the winner. Informals A step away form the tedious business games and into the lighter side of the festival, the informal games are spread across all 3 days of NEEV with events like Human Foosball, Zorbing, and many more! So are you joining us this winter ?